Four women named Res, Gay, Doll and Brite who swore to be friends forever, become domestic helpers when they go over to another country. However, Res is beaten to death by her employers, making the other three worry because her husband gave her one condition if she comes with her friends: that she comes home safe, sound and alive. Brite, Gay and Dolly decide to bring their dead friend Res home. 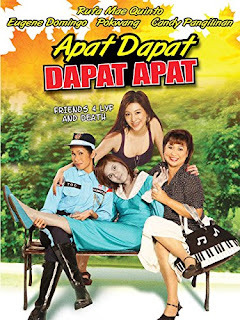 Apat Dapat, Dapat Apat: Friends 4 Lyf and Death is a Philippine comedy film, focusing on friendship between four friends.